When an individual is diagnosed with cancer and scheduled for radiation treatment, one of the first things their clinician will do is prepare a radiation plan b. This is done by “contour imaging” of the tumor(s), targeting areas affected by cancer for radiation treatment while protecting healthy tissues. However, if multiple clinicians are given the same image of a tumor, generally they will each produce different contours. In fact, studies have shown clinicians’ contours deviate considerably from each other, ranging from 5 percent up to 60 percent variance. This phenomenon of “inter-observer variability” (which can be seen very clearly in the first image below) could potentially result in suboptimal patient care. Segasist Technologies (@segasist) is a Canadian software company may have a clever solution to this problem. 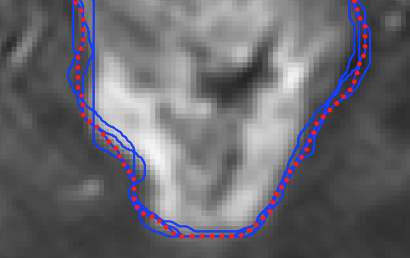 The company’s software Reconcilio, which received FDA 510k approval in late-2011, offers clinicians automated consensus contouring of tumor images to address the problem of inter-observer variability. 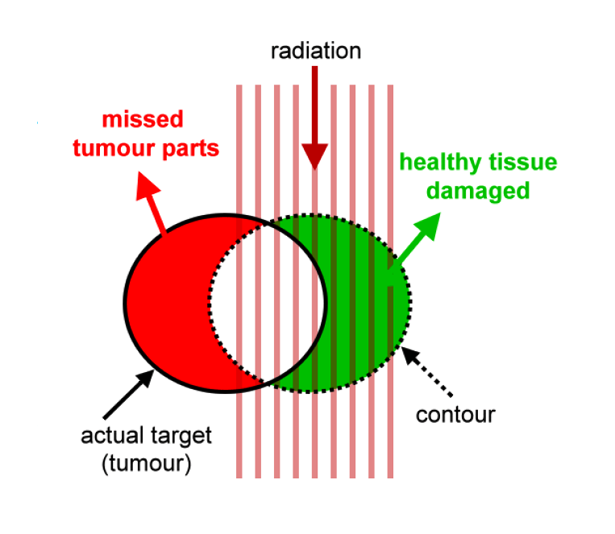 Reconcilio works by creating an outline of the tumor that is the “best-fit” or average of the other outlines created by the inter-observer variability, ensuring that all the tumor is included and that the least amount of healthy tissue is included. The software was licensed from the University of Waterloo and Segasist was launched in 2008 with a $750,000 seed investment from venture capitalists. Segasist validated its software in a study published in mid-2011 in The Red Journal, a prestigious oncology publication. Now the company has turned to crowdfunding platform MedStartr to launch a campaign to raise $50,000, which they will use to put their technology into the cloud, which will enable the company to put the powerful software into the hands of many more doctors. The company admits it will take much more than $50,000 to achieve their objectives, but they believe MedStartr will provide their software an important validation that they can take to venture capitalists as they seek to raise $5 million moving forward. Supporters of the Segasist MedStartr campaign have several options for contributing which I have listed below along with the company’s video pitch. $50 or more – One custom designed “Fighting Cancer” t-shirt, a letter of thanks, a sponsor certificate and get listed as a supporter on the company’s website. $100 or more – A raffle entry for a painting priced at 1200 Euro, one custom “Fighting Cancer” t-shirt and get listed as a supporter on the company’s website. $500 or more – Six month user license for Segasist P-AC 1.0 (FDA cleared) software for the hospital of your choice given in your name and get listed on the company’s website as a donor. $1,000 or more – One year license for Segasist P-AC 1.0 (FDA cleared) software for the hospital of your choice given in your name and get listed on the company’s website as a donor. $2,500 or more – One user license for Segasist Formo 1.0 software (universal contouring for CT/MRI/Ultrasound) for the hospital of your choice and get listed on the company’s website as a donor. $5,000 or more – Two user licenses for Segasist Formo 1.0 software (universal contouring for CT/MRI/Ultrasound) for the hospital of your choice and get listed on the company’s website as a donor. $10,000 or more – One unlimited site license for Segasist Formo 1.0 software (universal contouring for CT/MRI/Ultrasound) for the hospital of your choice and get listed on the company’s website as a donor.